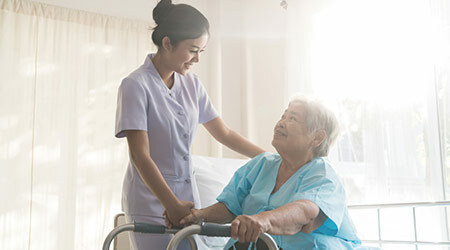 Hospitals and long-term care facilities come with their own sets of challenges. One such challenge is keeping patients and residents comfortable. Heating and cooling will play a major role in that. Standard HVAC systems force air through ductwork, and this can contribute to cross-contamination and odors. Packaged Terminal Air Conditioners (PTACs) offer a cost-effective solution with less risk of microbiological transmission and more control over proper temperature regulation. Here are some benefits of using PTACs (as well as some factors to consider when buying one). What are PTACs—and how do they work? First thing’s first: what exactly is a PTAC? PTACs are self-contained heating and air-conditioning units. Using electricity to move refrigerant, they can cool a room considerably while removing heat and humidity through a vent. Sometimes, PTACs are installed inside a window or close to a concrete wall. However, if you install a simple metal shield first, you can build a PTAC directly into a wall. Either way, they’re best for rooms that can be closed off from the rest of the building, since they’re not meant to cool or heat large areas. This makes them perfect for rooms in long-term care facilities. Plus, since PTAC units are self-contained, they don’t require any drain piping. They use a handy condenser fan to direct condensate water pulled from the air to the surface of the condenser coil. Then, the condensate water evaporates. It’s convenient and effective, and it reduces installation costs big time. PTACs are common in hotels already. But most of the factors that make them ideal for the hospitality industry apply to hospitals and other care facilities, too. Because PTACs are completely ductless, installation is much simpler than it would be with central air. This will greatly reduce your costs up front. PTACs are popular throughout the hospitality industry for the convenience they offer to individual rooms. Anyone can set their ideal temperature in their own room without affecting anyone else’s environment. The same will be true for any short- or long-term care facility. PTAC maintenance usually just means an occasional cleaning. Most brands design their models to make cleaning as convenient as possible. Many make it necessary only once in a blue moon. By heating or cooling a single room at a time, PTACs save you from wasting energy throughout an entire building. Many PTAC users find that they save significant sums in their electric bills because of the fine-tuned efficiency of their PTAC units. Generally, PTACs have great life spans. A single unit can last ten years or more. That cuts the potential costs of frequent replacements completely. PTAC units have a well-deserved reputation for quietness, especially when compared with other climate control options. This makes them perfect for reducing any potential disturbances—a particularly useful feature in facilities where patients need their peace and rest. Most PTACs come with heating options as well as cool, either via electric heat or a heat pump. That means you can keep your guests comfortable in winter without needing to invest in a separate heater. Most important of all: PTACs work. Provided you have a PTAC with the correct BTU for the size of the room in question, it’s bound to keep the environment as cool or warm as the occupants want. In short: PTACs are easy to install, easy to maintain, quiet, and do their job well. They’re the complete package for convenient, energy-efficient, user-friendly climate control. First off, you’ll need to know how much you can spend on PTACs. That will shorten your list of possibilities by quite a bit. So, what’s your budget limit? Only you can answer that. It can range anywhere based on how much you can afford and how important it is to you to have the highest quality models. The climate of your region is going to be a major factor in what PTAC works best for you. If your area gets particularly cold in the winter, you’ll probably need a PTAC with electric heat. These systems are much better for heating than heat pumps. If your region is known for mild winters or even stays warm year-round, there’s no reason a heat pump model won’t do the trick. By taking the specifics of your region into account, you can look for the types of PTACs designed to suit them. As mentioned before, PTACs are built for heating or cooling one room at a time. That’s part of what makes them such a good option, but it also means you’ll need the right sized PTAC for a room. Do a little research into the BTU power needed to heat or cool your rooms. There are plenty of resources on the web to help you. The energy efficiency of a PTAC unit is measured in EER (energy efficiency ratio). A higher rating means bigger savings on your electricity bills. Units with higher energy efficiency are probably going to cost more at first, but they’ll also end up saving you plenty in the long run. PTAC units have either a one-fan or two-fan system. Two-fan systems are almost always much quieter than one-fan alternatives. In fact, they’re usually the only way to get a reliably quieter system. Other than that, most major brands have about the same noise levels. If it’s important that your rooms be quiet—and in the case of a hospital or long-term care facility, it probably is—you’ll want to go for a two-fan PTAC system. There is always an option. There are as many PTAC options as there are situations to use them. With a little digging, you’ll have no trouble finding the perfect fit for your facility. Jenna Anderson is a customer experience team member with PTAC4Less.